Welcome to the March issue of Home Farmer – the one that usually signs off the arrival of spring and the start of all the real work in the garden. We have a good number of essential articles to help get you off to a flying start, from our gardening calendar with John Harrison and a guide to growing in shaded areas by Elizabeth McCorquodale to make the most of all your plot, to sowing seed under cover and advice on growing (and using) your potato harvest. 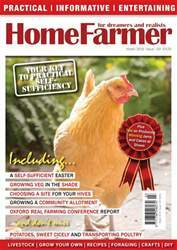 We also show how you might enjoy a self-sufficient Easter feast with a little advance planning, the factors to consider when deciding where to site your bee hives, and the best ways of transporting your poultry, whether bringing home your first birds or travelling to an event to show them. Our special features for March include an account of how allotment holders in Cardiff took charge of their own plots and how it enabled them to create an environmentally-friendly and welcoming site for the entire community; an article about helping increasingly-threatened hedgehogs to survive in difficult times; the long-term problems of plastic and how to reduce the damage it is doing; and a report from the Oxford Real Farming Conference, which this year attracted Environment Secretary Michael Gove, and is becoming ever more influential each year in holding back the excesses of the agribusiness sector. In addition we also have all our regular features, including foraging, winemaking and Dot Tyne’s smallholder diary. 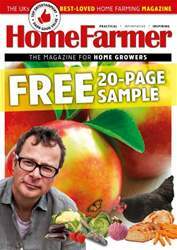 Whether you’re outside putting all the useful tips and advice into practice or stuck inside in the rain checking out the great articles, Home Farmer is your monthly key to practical self-sufficiency, whether in the home, garden, or on the holding.